Hi! I'm Kate of Kayteedids Couture, a boutique full of snuggly baby blankets! My husband, daughter and I live on the outskirts of Raleigh, NC but we are originally from San Jose, CA. My mom taught me to sew at an early age and now that I have a daughter of my own, I have rekindled my passion for sewing and creating. I have just started my own Kayteedids blog and I'm excited to be guest posting for Kim! I started with the purple layer. Really you can do whatever color order you want! Red, White (cool whip) and Blue for the 4th of July, the colors of your favorite sports team for a party, Red and green layers for Christmas...oh the list goes on! This is my left-handed pouring while right-handed photographing in my attempt to be like The Pioneer Woman...I wonder if she uses a tripod? That would have been nice. But I digress. 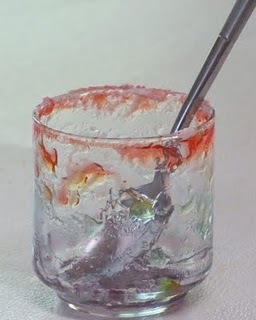 You make the jello using the quick set method. 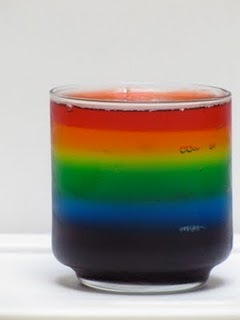 After several attempts I found that using slightly less boiling water and slightly less cold water to get a thicker pouring jello which was easier to create layers with. 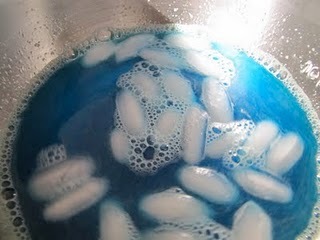 Here's a tip: When you pour your layer of jello, take a spoon and scoop out the bubbles. Better yet, scoop out the bubbles when it's still in the mixing bowl!! Put your glasses in the fridge to chill for 30 minutes. I used a tray for ease in taking the glasses in and out of the fridge each time. Now put your jello mixing bowl in the sink, add hot water and let it sit while you go off and do your laundry, clean the house, iron clothes for 30 minutes....oh who am I kidding, I watched tv. 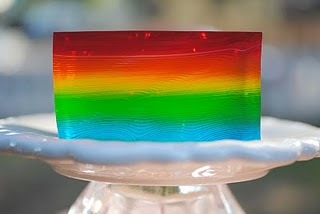 When you go to make the next layer of jello, your bowl will be clean and all remaining jello bits will have dissolved. Rinse and start the next color! Easy clean up! 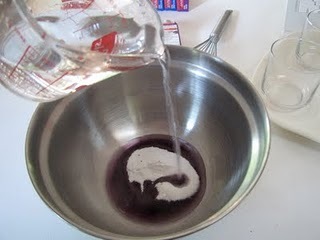 Take 1/3 cup of cool whip and mix it into the remaining purple jello. 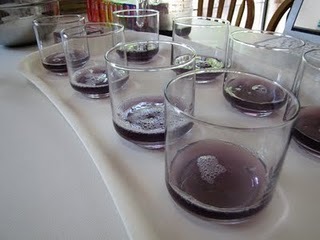 The directions I had said to "pour the mixture on top of the slightly set purple jello already in the glasses" but my coolwhip mixture was not pourable so I spooned it on top and then carefully spread it evenly over the purple jello layer. I was so proud and even caught myself dancing egotistically around the kitchen. Note: don't do your celebratory dance until you know you've actually done it right! Then you put this into the fridge to chill for 15-30 minutes. See how this can be an all-day feat? Okay, fast forward 15 minutes, and we're onto the next layer. Now here is where I got tripped up and had to change my original plan. Hopefully you can learn from my mistake. But if you do and yours turns out great, don't tell me about it. Kidding! I'd love to see it! 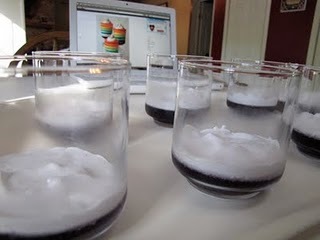 Take the glasses with your purple and cool whip layers out of fridge and pour the blue jello onto the purple cool whip layer. Just like that, so easy....WAIT!! Who am I kidding? I completely bombed at this step. And no, there are no pictures because I was too mad, maybe even a tear or two. 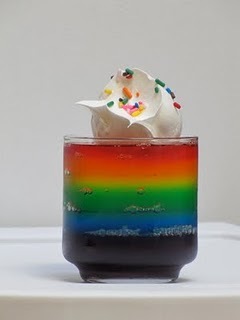 I tried pouring the blue jello from a pyrex pitcher and the stream was too thick...It busted right through that delicious cool whip layer right down to the purple layer. That caused the cool whip layer to float to the top. So after I ruined 2 glasses that way, I switched to a measuring cup thinking it would give me a wider stream. Nope, ruined 2 more. 4 left. So, using the measuring cup I dribbled the jello literally one drop at a time. This worked for 2 of them, the other 2 bombed as well. So what did I do you ask? I dumped them all out and started over with the purple layer. Oh I should mention that Kaylee had awoken from her nap, played, eaten dinner, and gone back to bed for the night before I started in on my new attempt. So please don't think I was neglecting my (almost) 2 year old for some jello. 2nd attempt at the purple layer poured & chilled - check. 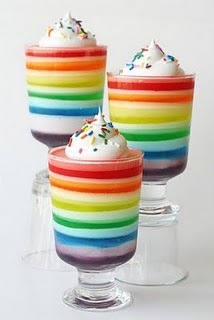 This time I decided to forego the coolwhip layer and go for this look from Zakka Life's blog instead. 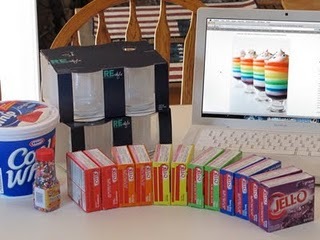 At this point I figured out how to pour jello slowly, widely, and softly! But I was too tired at this point to attempt the cool whip layers again. Are you ready for this magical tip? A spoon. A regular old flatware spoon that you eat cereal with. Such a simple solution that my complex brain couldn't think of it....Hey! No need to laugh at that! See why I said to scoop out the bubbles? I also did not use a piping bag to make my cool whip topping look like perfection, but I suppose this was a lesson in being okay with non-perfection anyways! We'll call it artistic! Yosemite's Half Dome anyone? 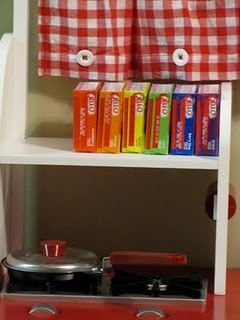 Another tip: If you have little ones who like to play "kitchen" or "store", open your jello boxes by sliding your finger or a knife under the entire flap (don't use the "press here" marks) then glue or tape it back shut to add to their kitchen! Thanks for reading! 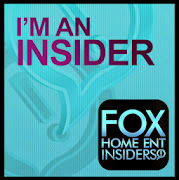 You can find me on Facebook and Twitter too! Thanks so much Kate for guest posting! I'm looking forward to trying this with my kids!